One water block per mining rig? Being the PC cooling freak that I am, I totally had to play with this. Namely – cooling a set of crypto-mining GPUs. The plan: shape a system of copper pipes into a single heat sink unit, providing 1x water input, 1x water output and multiple GPU interface surfaces. The result was the following module that can for example be assembled in a set of 4 or 6 pieces in parallel. I'm not keen on investing in mining equipment, so I got three faulty Radeon r9 270s from Ebay. Thermal performance: Temperature delta of about 20-25 °C (water/GPU) , using 1x water block module and a 15W water pump (1000 l/h, 1 m h-max). Here is what I want from a laptop:17-inchlightweightquad-corecustom keyboard?!? In real life, however, "lightweight" doesn't go with any of those. So I set off to put together my own 17-inch-lightweight-all-powerful kind of thing. The Toshiba Satellite C870 AIO The first candidate was a cheap deal for a Toshiba Satellite C870 with wrecked hinge plastics. Originally I was thinking to use this as a (normal) laptop, but I had to look for new display plastics, keyboard and what not, so what the heck, I decided let's do it another way. First thing I tried was to just put some aluminium corner profiles to the hinges and use them as a stand. That worked nice, but I had to somehow attach the 17-inch display panel to the chassis. Sure, plastic band was first thing on the list ;) But anyway, I bought some more aluminium profiles, cut them, drilled them and fixed myself a nice little frame for the display. What you get is a % of % of what you give.But you don't really get it, because now it is only % of the minimum %.Profit. So I recently mined a few days with Nicehash, mainly to test some water cooling setups. 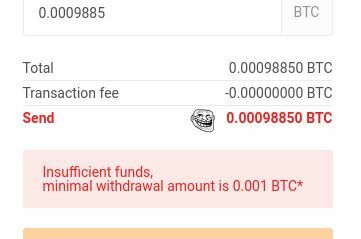 As the Windows Nicehash app proudly stated that my fortunes are now in excess of 0.001 BTC ($8.00 - $9.00 of old plain money at the time of writing), I decided to give those wary baked Radeons a brake. The whole setup occupied a considerable portion of my desk and a nearby sofa, so I was relieved to capitalize on accrued earnings and disassemble the whole thing.